If you’ve been in the internet marketing industry for awhile, you know SEO tools are a dime a dozen. They all promise to help you rank, build backlinks, and give your online business a traffic boost. A simple ‘SEO tools’ Google Search generates an endless amount of options. Unfortunately, a lot of these tools don’t deliver on their promises. And as a newbie, it can be downright difficult separating quality tools from those merely selling false hope. 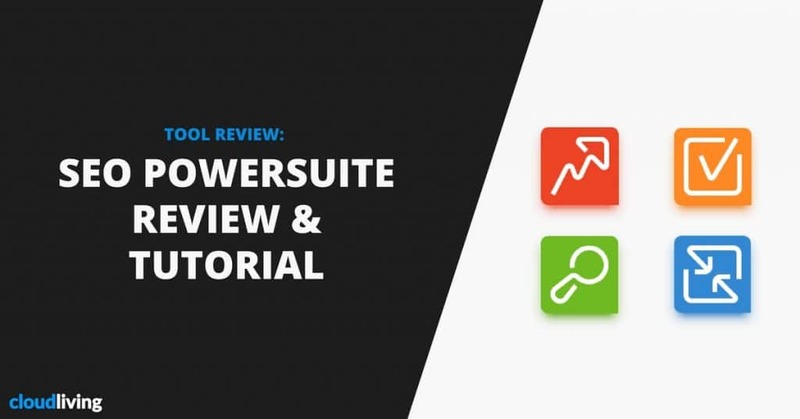 In this article, I review SEO PowerSuite and see whether it lives up to the hype. 1 What Is SEO PowerSuite? 2.1 What Can Rank Tracker Do? 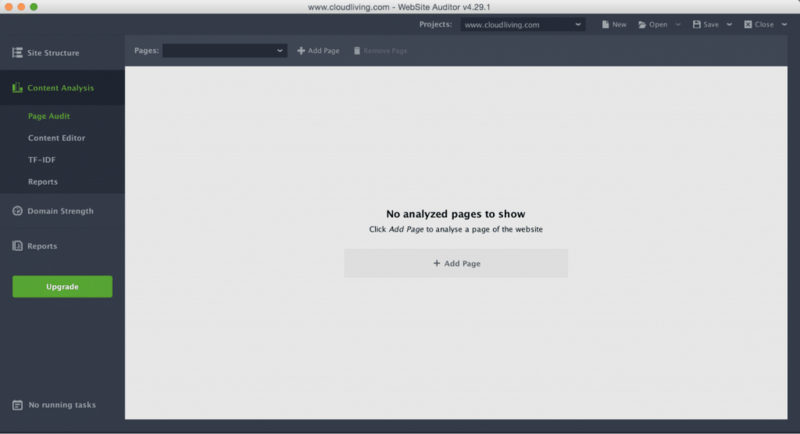 2.4 What Can Website Auditor Do? 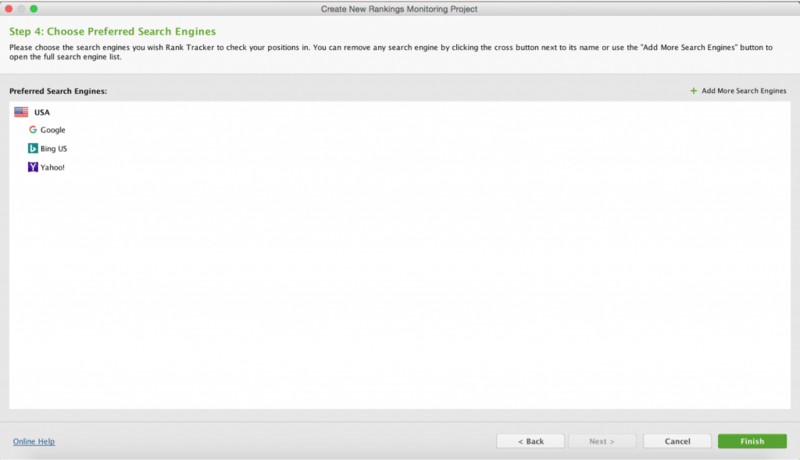 3.1 Features: What Can SEO SpyGlass Do? 4.1 Features: What Can LinkAssistant Do? Collectively, these applications are designed to help you with different areas of SEO and website management (i.e. rankings, on-page, backlinks). Now I’m going to give an honest review based on my true experience using the respective tools. I will show you the value of each tool, give my opinion, and let you decide for yourself if SEO PowerSuite is worth the price. Let’s begin with Rank Tracker. Rank Tracker’s main appeal therefore is to save you time while providing great results. Here’s exactly what the application offers. What Can Rank Tracker Do? With this knowledge, the promise is you’ll be able to identify profitable keywords to target and figure out how well you’re ranking for your respective keywords. Now, let’s dive deeper into the application and see if it actually fulfills its promises. Below we analyze Rank Tracker according to its performance, ease of use, and value for money. The main purpose of Rank Tracker is to check your rankings and help you conduct keyword research. Without accurate rankings, the tool would be useless. We double checked the ranking offered by Rank Tracker and found the results are pretty accurate. Rank Tracker tells us our post www.cloudliving.com/examples ranks number 1 on Google for the keyword ‘amazon affiliate websites'. You can track rankings from virtually every search engine. 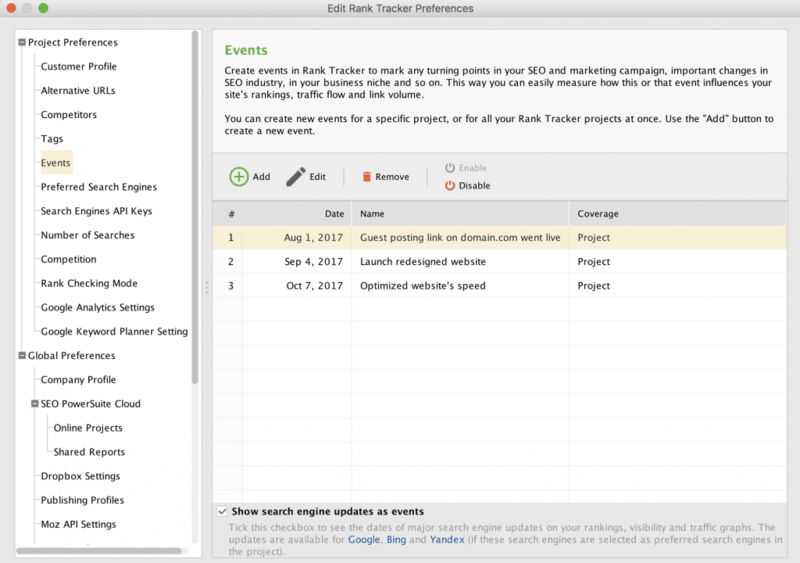 From local search engines to even sites like YouTube, Rank Tracker solves all your ranking needs. 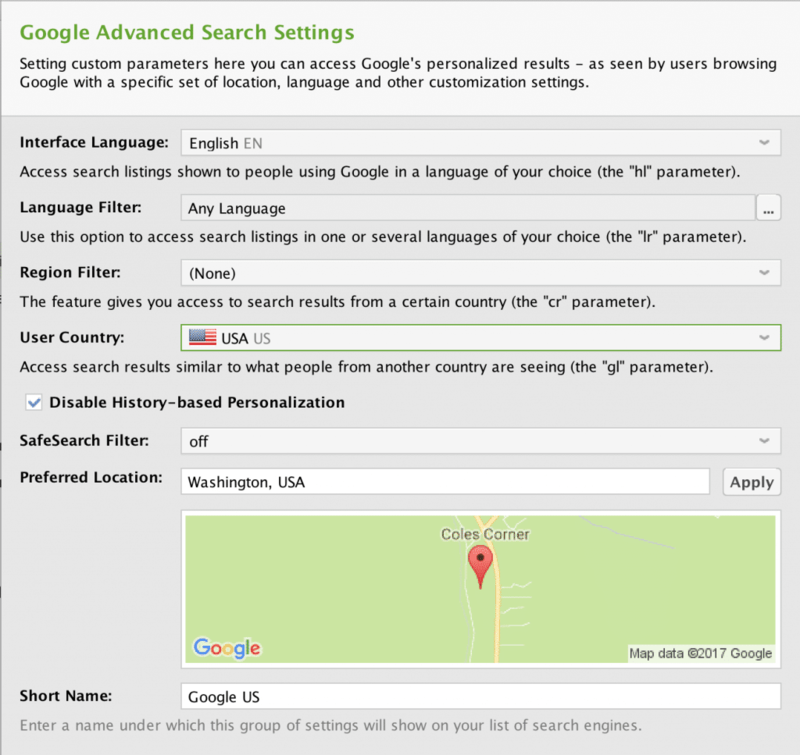 You can even add custom parameters to personalize SERP results as seen by users browsing Google with a specific location, language and other customization settings. For example, if you want to check your US ranking, go to Preferences >> Preferred Search Engines >> Hover next to Google and click on Add Custom. By entering your keywords, you get a clear indication of which pages are ranking (and which ones aren’t). This lets you know where you should devote your attention. 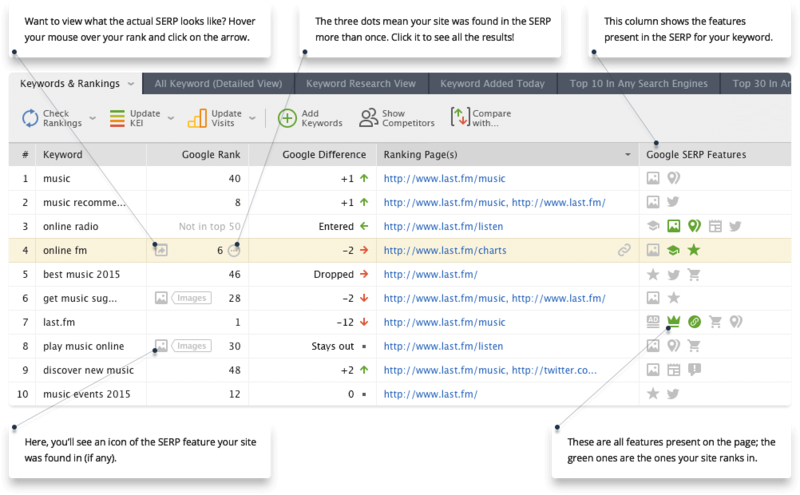 Rank Tracker lets you track various SERP features. 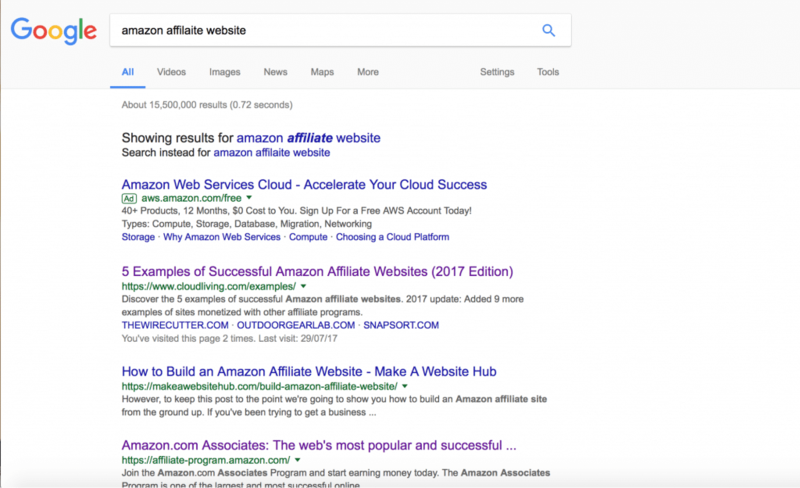 This is becoming more and more important these days because gone are the days where you only had to focus on the top 10 results of a search engine. 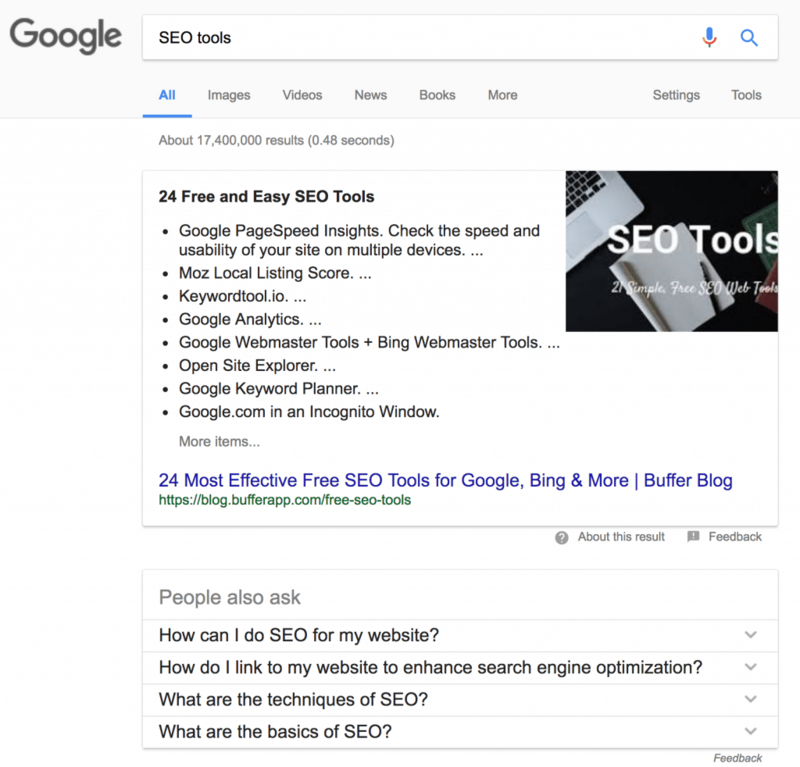 Nowadays there’s additional SERP features that if you can rank on, you can reach more users and ultimately generate more traffic and sales. 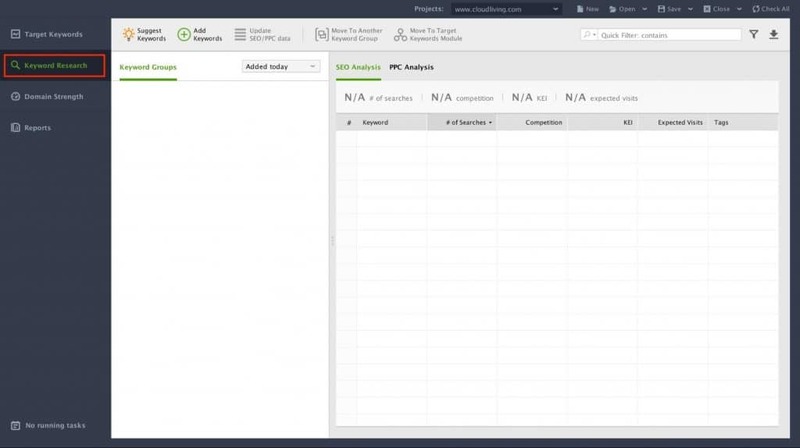 With this tool, you can collect data on these SERP features and see how your site is performing. Unlike other cloud-based rank tracking tools, you can insert an endless amount of keywords. Keep in mind, the more keywords you enter, the longer it’ll take for Rank Tracker to pull up the data. Whenever you enter your keywords to check your rankings, you can see your past history. Did your rankings go up or down? Rank Tracker will be able to tell you. I love this feature because it’s a great way for measuring the true results of your SEO efforts. In addition, Rack Tracker also keeps a SERP history so if significant ranking fluctuation happens you can quickly see who the winners and losers are. This will help you gain valuable insights on which is working at the moment. Rank Tracker connects with your Google Analytics and lets you see how many visits you got for your respective keyword. A problem with most desktop-based rank tracking software tools is it usually takes a VERY long time for the application to scrape search results and present the data to you. Surprisingly, Rank Tracker is pretty darn fast. Obviously, the more keywords you have, the longer it’ll take. Nonetheless, it’s still one of the fastest rank tracking tools out there. One great feature available in all SEOPowersuite tools is the Scheduler which lets you run certain tasks regularly on a specified date and time, so that you don’t need to manually initiate the task everyday. To set it up tracking, go to Preferences >> Scheduler. Add a new task then choose the task you want to perform. Note: The tasks will be different depending on the tool you’re using. 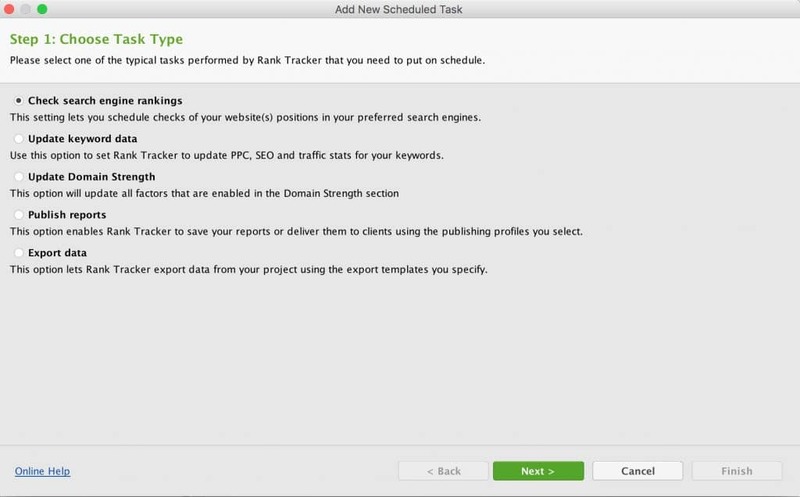 For example, here’s a list of tasks available for Rank Tracker. You can use this feature to keep track of important events or changes that might influence your site’s rankings. Google releases a new update. A new backlink goes live. These events will appear on your rank progress graph making it very easy for you to see how each change you make affect your rankings. With that said, there are still a few ways we think Rank Tracker can be improved. In addition to tracking rankings, Rank Tracker also offers you the ability to conduct keyword research. 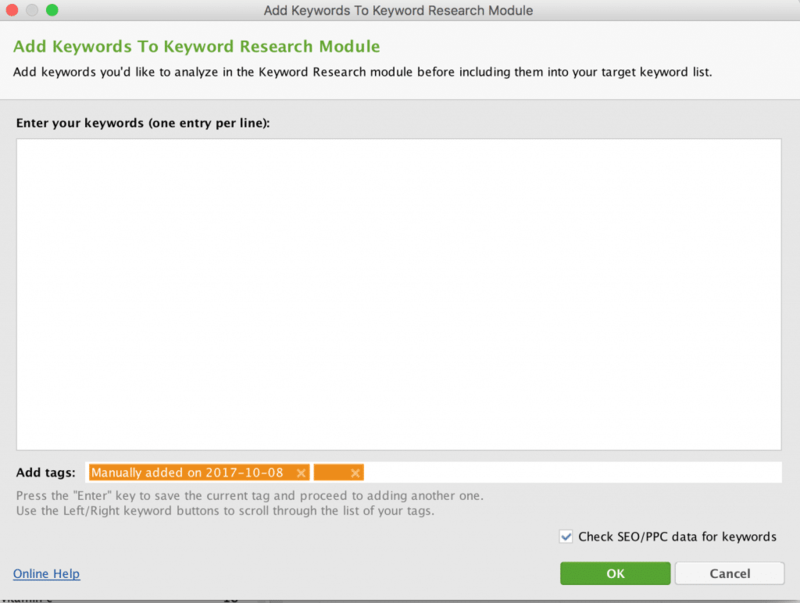 At first glance, it seems like a very well built keyword research module with all the important features you could find in current top-rated keyword research tools. But after more thorough tests, we concluded that it still has some flaws that prevent it from being effective. 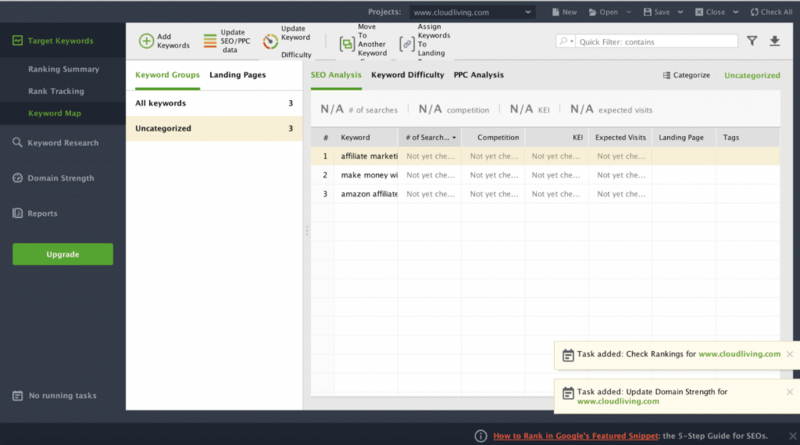 However, if these are fixed, we honestly think this could be the most affordable yet most powerful keyword research tool currently available on the market. Let’s me show you how it works. You start off by clicking on Keyword Research on the left sidebar. On this screen, there are 5 main actions you could do. This is a very powerful feature to help you quickly generate thousands of keyword ideas. You’ll be able to choose from a list of 19 different methods to generate long-tail keywords from your seed keywords. 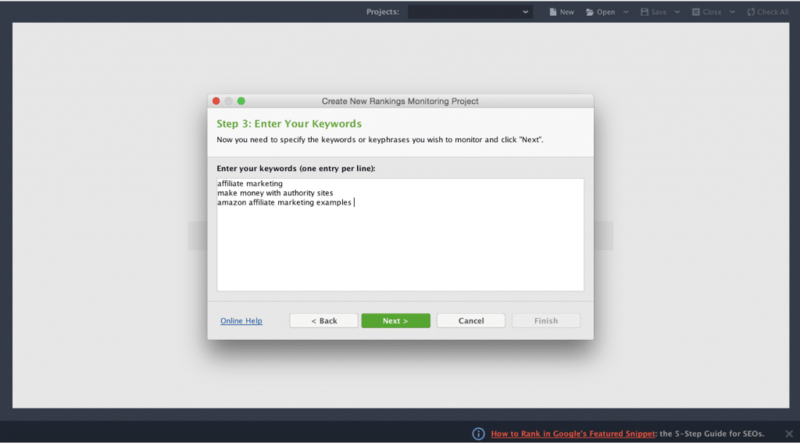 You can add your own keywords to analyze using the tool here. One great thing is that you can add tags for better filtering and categorization later. Rank Tracker can pull keyword search volume data from Google Keyword Planner for you. But as of June 2016, Google no longer displays exact search volume data for free users. Instead, they just show search volume ranges. Unlike Ahrefs or KWFinder, Rank Tracker doesn’t use an alternative database to get exact search volume data for each keyword. This is the biggest flaw that makes Rank Tracker’s keyword research module unusable because the ranges aren’t useful for determining the true value of a keyword. 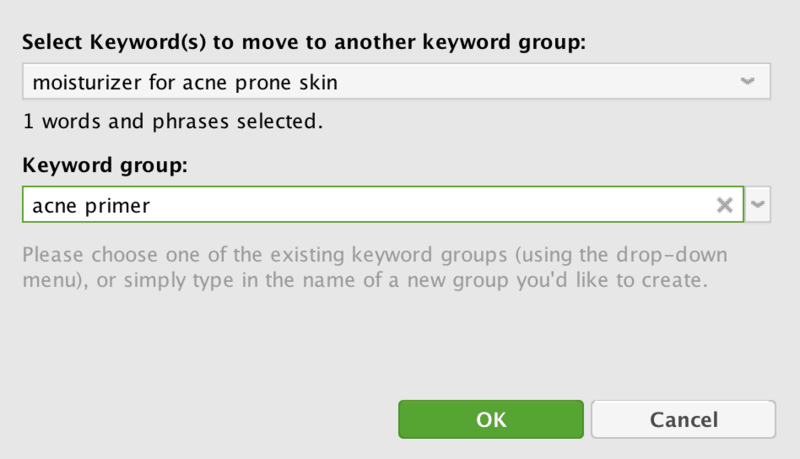 This allows you to categorize your keywords by group. And finally, when you find a keyword that you’d like to analyze even further, you can click this button to add it to the Target Keywords list. You can navigate to this list by clicking on Keyword Map. 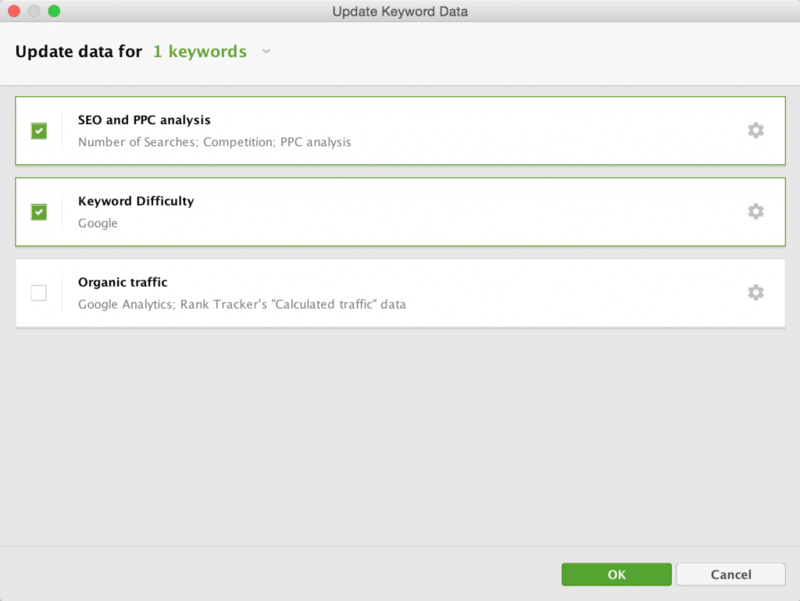 In here, you can dip deeper into the top 10 competition for every keyword by clicking on Update SEO/PPC data and choosing keyword difficulty. Once you do, you’ll see your keyword difficulty scores (this feature is quite similar to Ahrefs KD and KWFinder DIFF score). In fact, it looks like RankTracker is trying to do something quite similar here. However the problem is they use their own database of backlinks to calculate their metrics such as Keyword Difficulty Score, but there’s no public research that says their number is correct, nor do we have enough experience with this tool to verify the numbers ourselves. As a result, this is the second biggest flaw with RankTracker (the company should publish more information to prove their keyword difficulty score is accurate and reliable). Enter the site you want to check. Connect to your Google Analytics account if you’d like. If you don’t want to, you can simply click Next and it’ll skip this step for you. A cool feature is you can choose from an endless amount of search engines. Just click ‘Add More Search Engines’ and you’ll see their full list - this is great for seeing how your localized keywords are ranking. Tip: Remember to custom parameters as mentioned above to get accurate rankings for the location you want. Let rank tracker do all the work (it usually takes a few seconds for them to bring back the data). Once done, you can analyze your results. And use this information to double down and improve the pages that are generating high rankings. If you’re looking for a reliable, proven tool for measuring your rankings, you can’t go wrong with Rank Tracker. It’s perfect for one person, but if you have multiple people in your team, you will need to buy additional licenses. 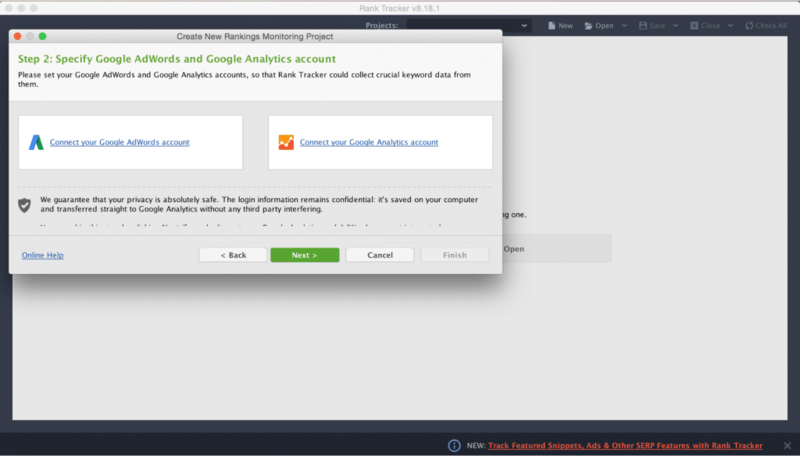 Doing so will still be more affordable than most cloud-based tools because Rank Tracker lets you track unlimited keywords and all team members can use the software on the same cloud project. As a result, we highly recommend it for keeping tabs on how well you’re ranking for your respective keywords. In terms of conducting keyword research itself, you’d probably be better served using Ahrefs or KWfinder. And then plugging those keywords into Rank Tracker to measure their rankings. Website Auditor is an application that focuses entirely on on-page optimization & analysis. In short, it lives up to its name and audits your entire website for you--revealing key SEO factors that you should improve to give your site a boost. 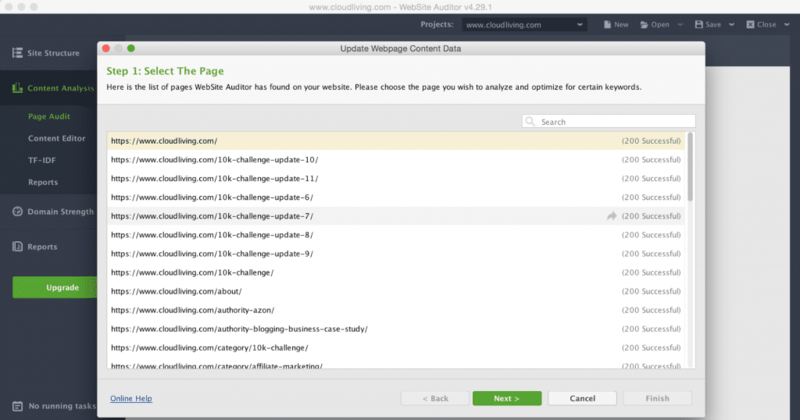 What Can Website Auditor Do? Run comprehensive audits of your website and identify On-page SEO issues. it takes into account every on-page aspect of SEO and provides a full, comprehensive report on how your site stacks up. If you have a site with a lot of pages and information, it would take WEEKS on end for you to conduct a complete SEO audit by yourself. In fact, it would be quite stressful and frustrating. The great thing about Website Auditor is it does all this work for you. And presents the results to you, quickly and easily. This is a huge help, especially for newbies. It breaks down what’s wrong with your website, why it’s important you fix it, and actually shows you how to do it. It’s the one feature we use the most. Reason being is you can add any page to this feature and see how well it’s doing in terms of on-page SEO in comparison to key benchmarks. Click Add Page. Once you do, every page from your website will be shown. Choose the one you want to analyze. 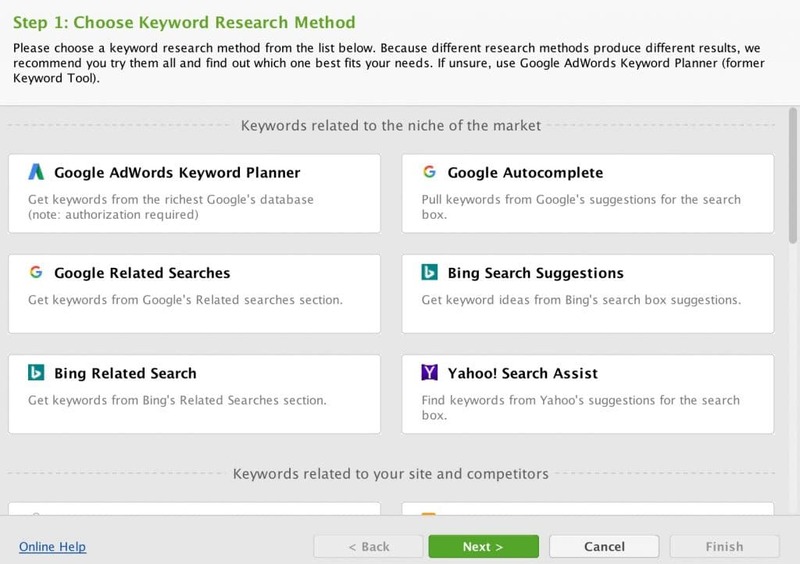 Then enter the keywords you want to analyze your content for. Once you do, hit finish. And let the tool go to work. You’ll be able to see how well the page is doing by clicking on Page Audit. This is extremely helpful because just by fixing some of the issues here, you can quickly improve your on-page SEO. Content editor is quite handy as well. You can make changes directly to your content, and see how those changes improve your page's SEO scores. However, keep in mind, this is just to quickly see how changes to your site’s content affect your on-page optimization score. After you’re happy with your optimization, you still need to make lives changes on your site in order for visitors and Google to see. Lastly, the TF-IDF is super good. If you’re not familiar with TF-IDF, it’s basically a tool that measures the prominence of your respective keyword on your competitor’s pages. It gives you a MIN, MAX, and AVG indication of your keyword count within your content. As a result, you can see how you shape up to your competitors - and determine whether or not you should use more or less keywords in your content. For example, if your TF-IDF score is less than your competitors, you’ll know you should use more keywords. And vice versa. Ideally, you want to use this tool to make sure your most important keywords are within the recommended levels. By following Website Auditor’s recommendations, your content will be more topically optimized for chosen search queries and have a much higher chance of ranking high in the SERPs. This is essentially what other tools like Market Muse or Ryte are providing at a much much higher price. Just for comparison, Market Muse’s lowest plan starts at $500 month with a minimum 3 month contract. You can get the same functionality with Website Auditor at the price you can actually afford. This is a really great feature and we’re actually incorporating it into our internal content optimization process. It’s still early to tell if it’s gonna help a lot with ranking but we’ll keep you updated. I’m not sure if it was just my computer, but Website Auditor took a VERY LONG TIME to present the results to me. Now, this is understandable, considering it goes through your entire site and provides a comprehensive audit. It should take long (so maybe I’m just super impatient). But it took approximately 20-30 minutes to gather the data. That’s understandable. You get a rough overview of your site audit, but in order to see the specifics you’ll have to upgrade. The usability is very similar to the other applications. All of the tools in the PowerSuite have pretty much the same user interface, making things quick and easy to set up. Enter your website and click finish. Then wait; this bar on the left will tell you the progress of the audit. Once done, click on Site Audit. Here you’ll see a comprehensive snapshot of your site’s audit. You’ll see where your site is excelling and where it needs improving. If you’re not sure what any one area means, simply click on it. And you can read up on why it’s important to solve the respective issue. You can click on each area to dig deeper. For instance, the site audit for Cloud Living tells us we have 421 broken links. If I click on this, I can see which links are broken (have to upgrade) as well as read up on the importance of getting these links fixed. You can do this for each SEO on-page factor; it’s great especially for newbies who aren’t fully aware of all the different on-page optimization strategies and tactics required to rank well. What I love about Website Auditor is it’s actually a great tool for BOTH SEO newbies and seasoned vets. Usually tools that are great for professionals, aren’t really useful for newbies. And vice versa. But this application is an exception. I highly recommend it if you have a well-established site and you’re looking to improve your on-page SEO (you’ll save a BUNCH of time). Now with that said, if you’re just starting out and you hardly have any content on your website, you can do without this tool. Sure, it’s helpful. But there’s not much of an audit to conduct for you. Instead, you’ll be better served just learning up on the basics of SEO and making sure you nail them while you get your site up and ready. Once you have a well-established site, I definitely recommend using Website Auditor to review and improve your SEO scores. SEO SpyGlass is the third tool of SEO PowerSuite; it focuses on researching links and gathering intelligence on your competitors. If you’ve been a reader of Cloud Living for awhile now, you know the importance of building links. In short, every link that points to your site is helping build your authority and ultimately your rankings. One answer is you can research your competition and see where they’re getting their links from. By doing so, you can conduct outreach and hopefully start generating links from similar sources as well, so you too can start ranking high for your respective keywords. This process of researching your competition and finding their backlinks is best performed via a tool. And that’s what SEO SpyGlass promises to do for you. Features: What Can SEO SpyGlass Do? The main job of SEO SpyGlass is to spy on your competitors and see where they’re getting their backlinks from. One way SEO SpyGlass pulls backlinks is via their own database, through Webmeup or SEO Powersuite Link Explorer. This database is growing pretty fast, and proves to be quite useful. With any backlink tool, however, it’s important to see how it stacks up to the other tools in the marketplace. 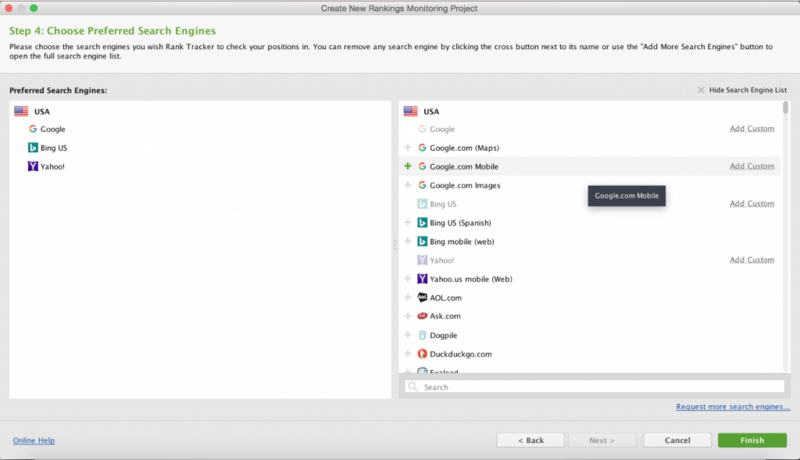 As a result, we did a side-by-side comparison between SEO SpyGlass’s Webmeup tool, Ahrefs and Open Site Explorer to see which tool generated the highest number of backlinks. As you can see, Webmeup came in 2nd place and found about 80% of the backlinks that Ahrefs did. This isn’t bad. And quite frankly, this goes to show the large amounts of data that SEO Spyglass pulls from. In addition to Webmeup, the tool can also pull backlinks from Google Analytics and Search Console as well. This is a unique feature because no other tool on the market can currently do this. As a result, once you combine backlink data gathered from Google Analytics and Search Console you can get a very good comprehensive outlook on the true backlink performance of your website. With SEO SpyGlass, you get to see a collection of all your backlinks alongside important SEO factors so you can easily judge the quality of the link. You can update these SEO factors by clicking on ‘Update InLink Rank’ and choosing what you like. One cool feature is Penalty Risk. By clicking on it, you can identify harmful backlinks by seeing how risky a backlink truly is. In addition, we also like the Backlink Traffic feature because it connects with Google Analytics and shows us which backlink is sending us traffic. InLink Rank which is similar to PA by Moz and UR by Ahrefs - measures the power of a page. Domain InLink Rank which is similar to DA by Moz and DR by Ahrefs - measures the power of a root domain. They claim to use the public formula that Google uses to calculate the old Pagerank. However, you should keep in mind that unlike Ahrefs, SEO SpyGlass doesn’t have any public data on how effective (and reliable) these metrics are so you shouldn’t take the results at face value. When I asked support more about their metrics, they also provided very generic answers. So there’s really no way to currently verify how accurate these metrics truly are. You can also compare backlink profiles with up to 5 other sites. To do so, click on ‘Domain Comparisons’ and ‘Add Domains’. Once you do, enter the sites you want to compare. And you’ll see a side-by-side comparison of how you stack up with the competition. This is super useful because you get to compare your domain with the competition on a variety of different factors. Everything from text links to dofollow backlinks to Domain InLink Rank. It’s much quicker to generate results via other tools such as ahrefs. SEO SpyGlass is a lot slower. Un-proven SEO metrics - There is no public research about how effective their metrics are at measuring the power of root domains and URLs. If the team could do this then these tools would become extremely useful and a complete bargain for the price. Again, usability like for all of the other tools is top notch. It’s pretty much the same process. However, SEO SpyGlass is even easier to use than the other applications. It just involves a few clicks and you’ll have your list of backlinks. Enter the URL you want to analyze. SEO SpyGlass will get to work and produce a list of backlinks. You can also compare domains, a useful tool for seeing how you measure up to the competition. When it comes to backlink explorer, Ahrefs is still the #1 tool on the market. However, it does come with a premium price that not a lot of people can afford. Although SEO Spyglass doesn’t beat Ahrefs in terms of performance, it’s still a very good tool with a large backlink index than other competitors such as Open Site Explorer. Therefore if you’d rather not fork over the high monthly price for Ahrefs (the gold standard of backlinking tools), SEO SpyGlass is a very good second choice. Great affordability and performance make it a decent tool. LinkAssistant is designed to help you conduct outreach and build links. You simply enter your website and you’ll be presented with a list of potential link building opportunities. Features: What Can LinkAssistant Do? One thing I’m always looking for is how easy is a tool to use for a complete newbie. In this case, LinkAssistant is one of the most user-friendly tools out there (that can be said for SEO PowerSuite as a whole). They really do a great job at presenting a clean user interface, and make things super easy. Once you’ve entered your site, you need to click on “Look for Prospects” or “Add” to add manually. After you select your prospecting method, you’ll be asked for specific keywords you want to focus on. For the purpose of this test, I entered just one keyword ‘SEO’ because I wanted to see how quick the tool is. After clicking finish, I had to wait 4 minutes and 12 seconds before LinkAssistant finished gathering a list of prospects. This was surprisingly pretty fast - I thought it would take much longer (keep in mind, I only used one keyword. The more keywords you use, the longer it will take). I was presented with a total list of 146 prospects. This was a pretty healthy list of prospects, with a mix of larger sites and smaller ones. Depending on your keywords, you’ll get a few irrelevant prospects. For instance, a few of the prospects were YouTube, forum based, or freelancer websites such as UpWork. But if you can mine through the list, you’ll find some good gems that you may have previously never found. As a result, I think the tool can be pretty helpful for prospecting, but a lot of the prospecting methods in the tool are outdated so I’d suggest you use the Custom Search Feature to add your own search queries. LinkAssistant gives you the option of connecting your email to the software so you can send and receive emails directly in the application. This is a cool feature because you can take care of your entire outreaching process in just one application. However, we personally think Gmail is a lot better because it’s cloud based and much faster. Very easy to use! The beauty of SEO PowerSuite as a whole is it’s set up with newbies in mind. You can tell they invested great care and resources into making each tool as user friendly as possible. And LinkAssistant is no exception. It pretty much follows the same interface as the above tools. You enter your URL, let it analyze the results for you, and from there you can view your link building opportunities, analyze backlinks, and send outreach email. Link Assistant does what it promises to do but we still prefer using Google Spreadsheets, Gmail and Mailshake to manage our link building campaign. Because unlike rank tracking or doing SEO audits, executing an outreach campaign usually involves multiple people doing each step of the process and it’s just so much easier and faster to corporate in a simpler cloud-based system. That said, LinkAssistant might be good for prospecting as it has powerful features to check prospect quality. However, for the actual tasks of sending emails and tracking results we don’t think the software is necessary. It might be a powerful system 10 years ago but nowadays it’s no longer as effective. 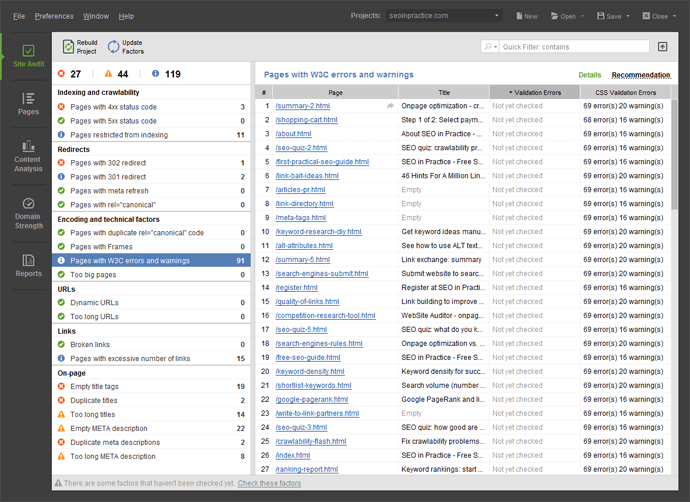 Now that we’ve covered each tool in detail, let’s talk about SEO PowerSuite as a whole. Below we discuss their level of support, documentation, pricing, FAQs, and provide an overall conclusion on the package. This 83 page PDF walks you through the main SEO activities required to help you efficiently organize your SEO process and achieve top rankings. Because if you’re a newbie, you can get caught up to speed with SEO matters very quickly. Better still, the PDF does a great job at walking you through, step-by-step how to use each tool. And generate the biggest bang for your effort. Plus, they also provide a collection of really good comprehensive videos that teach you how to use each tool. You can find the videos here. In addition to the above resources, the team over at SEO PowerSuite also does a pretty solid job with their support. They offer support free to all users, and it’s available 7 days a week. We personally had an issue with making the Rank Tracker work and we jumped on a call with their support staff and he was able to log into my computer using Teamview and make changes to the settings and make the software work. The support was very friendly and did a great job at helping us kick start the tool. SEO Powersuite offers quite a few options to cater to diverse groups of people. Free Version - This lets you try out each and every tool for as long as you want, only downside is you don’t get access to certain features and won’t be able to save your projects. Professional License ($299) - If you’re a one-man army or you have a small team, this is probably your best option. It lets you work with unlimited websites. Enterprise License ($699) - If you manage clients, you’re going to want to go with this option. Reason being it gives you all the perks of a professional license, but also grants you access to branded reports and lets you export stats. If you don’t want all 4 tools, SEO PowerSuite also gives you the ability to purchase each tool separately. Individually, each tool costs $124.75 for the professional version and $299.75 for the enterprise. If you do the math, it makes sense to purchase the tools individually if you only want 2 or less. If you want more, then you’ll save money by purchasing the bundle. Also, it’s important to note that you can activate your license on multiple devices but only one can run the software at the same time. Use the same license for all team members but only one person can use the software at a time. This would cause some inconvenience. Activate license on a VPS and share login access to the VPS with your team. This way you don’t have to close the software - just let it run on the VPS. The easiest way is to buy additional licenses for your team. SEO Powersuite offers 40% discount for additional licenses. Doe​s this price cover updates? In this case, SEO PowerSuite uses the term “search algo” updates to classify and roll out new updates. Unfortunately, you have to pay for these updates. The first six months are free, but after that you’ll be charged $8.33/month (or more depending on your license). 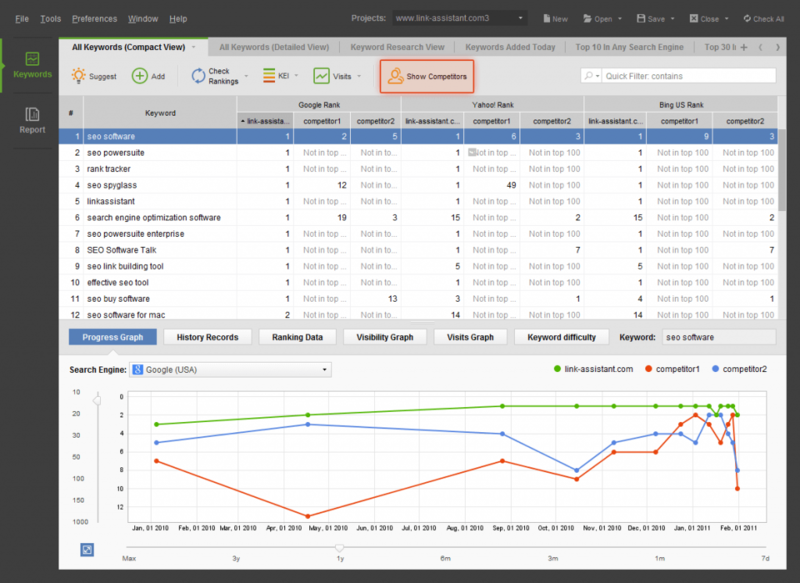 Overall, SEO Powersuite provides easy to use and effective tools to manage the entire SEO process. In our opinion, Rank Tracker and Website Auditor are the best tools amongst the 4. They provide excellent functionality at an affordable price and should be an essential part of anyone’s marketing toolbox. For SEO SpyGlass, it definitely cannot beat Ahrefs, but still gets the job done on a very affordable budget. LinkAssistant is a bit outdated and can be replaced with a similar cloud-based system. Of course, you may think otherwise. So we really recommend you hop on over to the site and download the software yourself and check out the free trial. I’ve been using the tool for a while and I’m really impressed with all the features it offers. Thanks for the great review! I have use SEOSPYGass at past. It was an awesome tool. But later I discontinued it. I’ll start using these tools again.. Please show me how to make this interesting program! Thanks for the review Tung! Do you strictly use powersuite or do you use other tools as well? And if you do, which one are those? I mostly use Ahrefs. But Website Auditor is my new favorite tool to do audit. Thanks Tung for this awesome reviews. When I using Rank Tracker, It need to wait for 24h to check again. How can you resolve it? Just FYI. There seems to be some issue in the theme. Please check. As usual a great review. I use SEO powersuite for the past 1 year for my clients. I am curious to ask you a question which I had been thinking for a long time. I recently purchased Generatepress theme. I was wondering how you created the filterable grid in the home page. Could you please share the details if you are using a plugin? Thanks for sharing this detailed review, just wondering what tools you will recommend for replacing link Assistant? Doing outreach emails or guest posts etc. I am planning to invest in a new SEO tool, and right nor confused between Ahrefs, SEMrush and SEO Powersuite. Which one would you suggest I invest in? Currently using Ryte. What do you want to use the tools for?